Ice It Down's subtitle says it all. 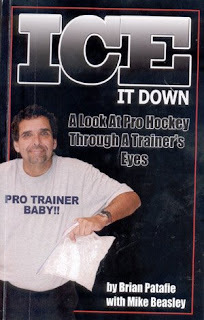 This book is "A Look At Pro Hockey Through A Trainer's Eyes." Brian Patafie is the wisecracking trainer ofor the Ottawa 67s. He formerly worked for the Montreal Canadiens and Calgary Flames organizations. He's a lifetime trainer, part time goalie and full time prankster. Needless to say, he's seen a lot in hockey, making for some great storytelling. Now he has compiled some of his favorite yarns and, with the help of Ottawa Citizen reporter Mike Beasley, created his own book. The book is entertaining, though at times downright crude. It reads as if you were sitting down with Patafie, sharing a few beers at dingy bar, and telling stories of hockey that he has actually lived through. Another way of looking at this book is as some sort of brainstorming session for a Slap Shot sequal. I do not think the writers of Slap Shot could even dream up some of this stuff. His favorite is the practical joke he played on Calgary Flames assistant coach Guy Lapointe. Patafie had someone warn Lapointe, who was relaxing in a sauna, that Patafie was coming to douse the coach with a bucket of cold water. Patafie knew Lapointe would counter, and Lapointe did, grabbing a hose and spraying down the trainer from head to toe. The only problem: Patafie was wearing Lapointe's very expensive suit! Patafie often talks about individuals, and not always in flattering terms. Patafie comes across as an honest but not a vengeful person. He actually seems to be quite genuine and appreciative of all he has gotten from the game. Some of the stories about drinking too much and womanizing, bad behaviour all around. Glorifying these stories usually turns me off, but Patafie does not celebrate this behavior. In fact, he often ends these stories with his recurring slogan "I hate hockey." These stories add a level of authenticity to Patafie's unique journey through hockey. These sleazy actions obviously happen. Travelling and living with a professional hockey team is not always a great life. He has had a good life and tough job, and sometimes he has to make good of the bad. Patafie does this by retelling these stories and making people laugh. It all makes for a book unlike anything else available this year. Though nearly 200 glossy pages, the book seems small, yet it is surprisingly heavy. That's a trainer for you - always sneaking in ways to get us in shape. The book is available in select stores in the Ottawa area, and through Patafie's website Ice It Down. Funny, Funny, Funny best way to describe it! Great Read, Lots of laughs he has had fun thats for sure! Little did I know, that when I met Brian Patafie in 1973, he'd still be involved in hockey. One of the funniest guys but one that really cared about his players. The problem is this book only tells half of it!